Spring of 2019 will see Muscle Rod Shop relocated to our new 10,000 sq ft facility in Boerne, TX, just up the road from our current home in San Antonio. Located just off the access road at exit 543, our new building will be purpose-built to our specifications and provide a newly fresh and functional environment for us and for our customers. In addition to new work space, the building features expanded service bays and lifts for those seeking just service, upgrades and modifications... upgrades to engines, suspensions, brakes, A/C, interiors... you name it. We've always provided these services but our space was very limited. We've changed that. With more space comes expanded services and expanded relationships with our suppliers. We're already certified dealers and installers for some of the industry's finest manufacturers, and we have showroom space dedicated to you to give our customers hands-on opportunities with their many fine products. Vintage Air, Ididit, Flaming River, Classic Instruments, American Autowire, Baer, Forgeline, Boze Forged... these are some of the products on display. We've also added a Design Center where you'll be able to look over these products and coordinate their function and appearance with each other. Where else can you get hands-on like that? Building a custom dash? We'll walk you through the many sizes, colors and finishes available from premier gauge manufacturers. Adding A/C? We'll show you systems and vent offerings. New wheels and tires and need guidance? We're here. We understand fitment. Want to upgrade brakes? These days its not just rotor size and piston count! Now you have many colors to choose from as well. Its a lot. And our design center and years of experience are here for you to make use of. 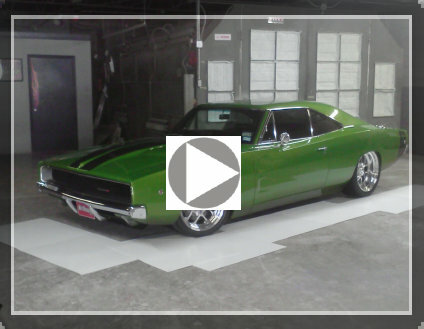 Of course, we will also still build the baddest muscle cars on the planet. Our widebody Muscle Rod build style is getting some additional tricks, with custom interiors and more scrutiny given to component selection to assure even finer builds. Our Modern Powerplant offerings are better by the day. We also offer many of the features of our Muscle Rod style on our Muscle Mod cars... these are essentially stock-bodied cars but with the powertrain and suspension upgrades of the Muscle Rod. These build styles all have at their heart upgraded engine systems, modern transmissions, and upgraded suspensions. Modern ammenities inside bring modern driving comfort and reliability to your ride while respecting the original look and feel. Our space is currently in build-out mode. Internal walls, floors and decor are coming together with the goal being to bring to Boerne, Kendall County and San Antonio even more of a Premier Restoration and Restyling center than ever before. We're excited about it. We know there will be many of you who will appreciate and utilize our services. So when we're up and running, come on in! It is our sincere intent to impress you. There will be a new phone number... to be determined.